Hi All! We are the Muñoz - Bryan family. I very proudly stand here today as a former THON child and the mother of these 3 amazing and adorable little humans sharing the stage with me as well as 2 who are unable to be here with me tonight! I’ll happily preface this speech and tell you that as mother I cry often so please bare with me! To give you a little background of our family story - I was diagnosed with Leukemia in September of 1995 and fought hard until January 29th, 1998, just days before turning 14 years old. I was told on two occasions that my battle was going to beat me. I could give you the intimate details of each needle stick, infection, hospital stay, but if I’m going to cry, it’s going to be happy tears only! This campus, the students, the atmosphere in happy valley - it’s always felt like home to me after my first visit in the winter of 1995. Being 11 years young, losing your hair and fighting for your life in 6th grade after being told the horrific words “You have Cancer” isn’t an easy pill to swallow. 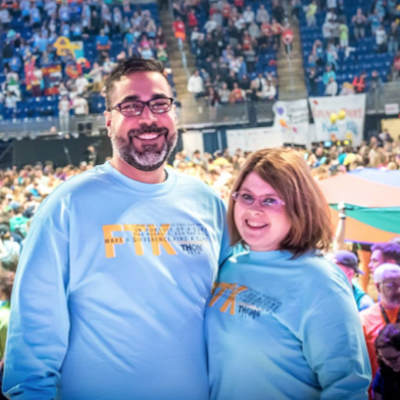 Battling leukemia wasn’t easy in any shape or form but this journey has given me some of the best people in my life, including my husband of 4 months, who I meet during his time as a THON volunteer. My 29 month battle with leukemia has truly made me the person I am today. Having cancer teaches you so much about loving the little things in life - the smell of snow, watching the sunset, holding hands, giving back and so forth. I’ve watched many children die during their battles over the last 23 years but I’ve also watch many live. I’ve seen their school photos, their dance photos, their wedding photos, their hair finally coming back in photos and so on. During that time frame I’ve watch THON grow too — I’ve seen it go from the White Building to Rec Hall to the BJC. I’ve seen totals on Sunday hit the 1 million dollar mark to the 10 million dollar mark. I’ve benefited from the funds raised in terms of music therapy, the Four Diamonds Fund covering the 20% of all costs my Mom’s health insurance did not cover, assisting with gas for my single mom’s car getting us to and from Hershey on our 40 minute drive one way, on a weekly basis and so much more. I’ve seen many THON themes as well. I’d have to say that the THON 2019 theme is starting to grow on me as one of my favorites. Shape the Moment— It really is a magical statement and it opens the mind to many thoughts. I’d like to share with you mine. From where I stand and the view I’ve had since my first THON as a survivor in February of 1998, Ive seen thousands of Penn State students fight for the tomorrow’s of those who have battled. The tomorrows you are providing will not be witnessed in your next few months here on campus, they compile over time to show you the true impact of your dedication, your time, your tears, your late hours, your hard work, your compassion and your mission. Those tomorrows are their moments. You are shaping a new moment each and every time you give yourself to end childhood cancer. Let’s chat numbers for a second- I battled leukemia for 860 days - however, as I stand here in front of you today, that number is minimal, because the total that truly shines through took place only days ago, on January 29th, 2019, I celebrated a very special milestone - 21 years cancer free! Thanks to those before you that sat waiting to put on what is by far one of the amazing events there is, played a role in giving me 7,675 tomorrows. Those tomorrows have shaped some of my most cherished moments . Moments that include a high school graduation, two proms, a college graduation, 3 very special births, first steps, Logan’s first time striking out a batter at the mound, Ava’s first ever soccer goal, Layla’s first dance recital, Abby’s cheer squad’s first, first place win, Ethan’s first passport stamp, Luis and I’s gorgeous PSU themed wedding day this past Fall and literally there have been thousands more. Let me ask all of you a question — How many of you here were born between 1995 and 1998? As I look out at your hands, many of you were born during the time frame that I was going thru my chemo treatment - so think of that for a second- your entire life I’ve either been a fighter or a survivor in the childhood cancer world. And in 20 years, many other survivors will stand here and say the exact same thing and it will be because of YOU. Every single one of you - your impact will last so much longer than this fundraising season and THON weekend. It will forever change you and any four diamonds family you come to know. That symbolizes Shaping A Moment! And I thank you for allowing the four of us to stand here and share this moment with you. Best of luck!